﻿State park ambassadors find unique ways to promote the outdoors. Devonte Hill turns on his camera and takes a deep breath, getting ready to begin his first mission as a Texas state park ambassador. “I just want to shoot anything that moves,” he says. Unsure of what story he might capture and eventually tell with his camera, Hill decides to keep an open mind and let the story unravel organically. After all, being open to possibilities led him to this moment as the leader of a group camping trip in Tyler State Park. 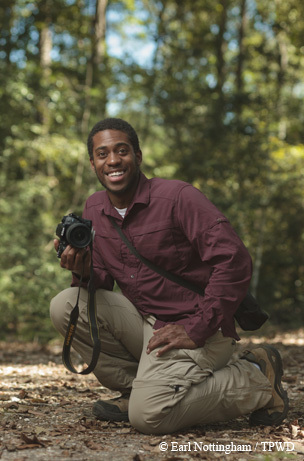 Hill, a student at Stephen F. Austin State University in Nacogdoches, was interested in producing outdoor films and saw the Texas State Park Ambassador Program as a prime opportunity to get started. He hooked up with Dream Builders, a student organization at the university that partners largely with Habitat for Humanity and plays an active role in serving the local community. The organization was looking to carry out a service project, and Hill, exercising his new role as an ambassador, suggested they take a trip to a Texas state park. “They were really psyched about it,” Hill says. In a busy world increasingly beeping and buzzing with technology, some people may think that today’s youth prefer wiring in to adventuring out. Texas state park ambassadors aim to reverse this trend. Zimmermann joined the program when it first began in the fall of 2012, while studying psychology and pre-med as a senior at St. Edward’s University in Austin. 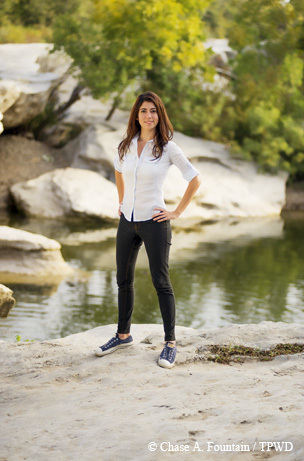 Perceiving the decline of outdoor recreation as a “public health epidemic” among today’s young people, she wanted to apply her medical interests to the ambassador program, hoping to help her peers unplug and unwind in the great outdoors of Texas. The Texas Parks and Wildlife Department’s outdoor education and outreach teams focus on creating the next generation of state park visitors and advocates. While programs like Texas Outdoor Family and the Buffalo Soldiers bring more families and minority visitors to state parks, there was no program to attract teens and young adults. With the average age of park visitors being in the 40s, TPWD outdoor education and outreach coordinator Ky Harkey saw a need and founded the Texas State Park Ambassador Program. “This demographic is the next generation to get involved in conservation issues and have children who they will introduce to the outdoors,” Harkey says. Initially, he formed the TPWD program within the framework of America’s State Park Ambassador Program, but he began to see opportunities to expand beyond its model and get the ambassadors more involved in community outreach, event planning, videos and social media. One of Harkey’s ideas for expan-sion was a team-building retreat at Colorado Bend State Park to kick off the 2013 program. 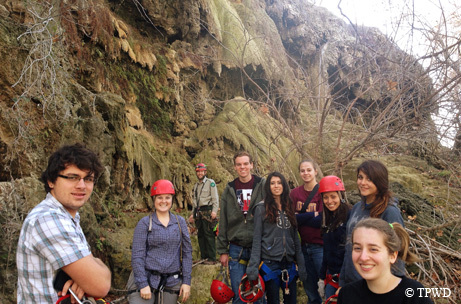 At the retreat, the newly formed team explored the park, rappelled off cliffs and discussed strategies to connect young people to the outdoors. Attending the inaugural year were seven ambassadors, including Zimmermann, ranging from high school students to graduate students. After the retreat, the team kept in contact through monthly video conference calls and has since evolved into a larger volunteer team. “The vision of the program is essentially empowering young adults to advocate for outdoor recreation within their communities,” Harkey says. That’s where Zimmermann comes in. Now working as coordinator for the program, she says a main component of her job is identifying outreach opportunities for the 16 current ambassadors. The program’s emphasis on personalizing the experience allows ambassadors like Hill to embrace individual interests such as video production while carrying out a leadership role. The group camping trip he coordinated at Tyler State Park unfolded into a nearly hourlong video that told a story about friendship and new explorations complete with one-on-one interviews and custom-made music. He said that despite its limited advertising, the documentary has seen decent success. There are several ways the ambassadors connect to their peers: delivering presentations, promoting state parks at events, organizing activities at state parks and carrying out individual interactions, like introducing peers to camping or hiking at a state park. Ambassadors take on projects based on their own skills and interests. Zimmermann says much of the value of the program lies in the freedom of individuality — it’s all about each ambassador’s unique, personal touch. The backgrounds of the current batch of ambassadors vary across the board, ranging from passionate film producers to aspiring park rangers to professional amphibian bloggers. Despite their colorful contrasts, they all share a common love: promoting and supporting Texas state parks and a healthy outdoor lifestyle. Hannah Halydier, a 25-year-old who majored in natural resource management at Angelo State University, challenged herself when she and another ambassador gave a presentation to a crowd of 150 in Round Rock. She said experiences like these have improved her ability to engage others. 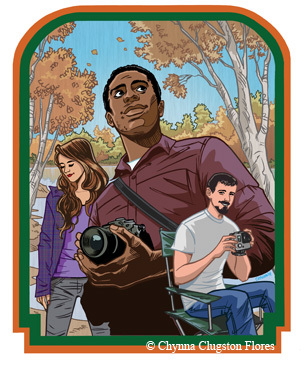 Josh Tiller, a 21-year-old who attributes his love of wildlife and nature to long road trips around the country, is a lover of hiking and biking and aspires to become a park ranger one day. “Personal fitness and public service have been two large driving forces in my life,” Tiller says. Tiller has his own YouTube channel, where he’s documented visits to Dinosaur Valley State Park and Cleburne State Park. He said the program has improved his marketing and people skills while also allowing him a “foot into the door of this amazing organization” by enabling him to meet a variety of park personnel. Of course, there are others, like ambassadors Natalie Davis and Marisela Montelongo, who got involved to engage their peers and promote Texas state parks. Montelongo organized a free concert, called Sunrise Music Festival, in El Paso’s Franklin Mountains State Park. Davis prefers to connect to people through film, and she runs a vibrant YouTube channel. In one of Davis’ videos, she poses the question “Why?” Why would park ambassadors spend the time and make the effort to try to change something that some people would say isn’t their problem? “We love being outside. And we love helping people experience all there is to offer in the great outdoors,” Davis explains. The ambassadors have kept busy, maintaining a presence at events such as Float Fest in San Marcos and UtopiaFest in the Hill Country, giving presentations at events such as Rockport’s HummerBird Celebration and carrying on their own volunteer projects. “It’s becoming increasingly more difficult to get young adults interested in getting outdoors. 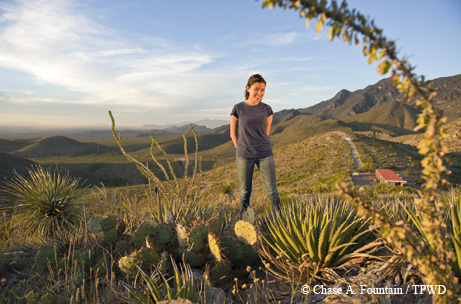 I think [this program] is important for the kids that are going to college or are starting to think about what career field they want to go into, because they can learn why it’s so important to conserve Texas lands and wildlife,” Halydier says. That is why 2015 will be jam-packed for the ambassadors. According to Harkey, next year’s goals are to develop partnerships with universities and young adult community groups, reach 3,000 young adults through ambassador outreach and host two training weekends. The first training weekend of the new year will be in January at Colorado Bend State Park. There, the ambassador team will develop bonds through team-building exercises such as rappelling and do some brainstorming for the upcoming year. Zimmermann and Harkey agree that the long-term goal of the program is to create a process for supporting outreach volunteers that can be replicated with other demographics and can be supervised by park friends groups, park staff and even community organizations. “We would like to grow, to increase our numbers. I think fundamentally that’s what outreach is all about. You know, the parks are there for you. And a lot of people just don’t get that message,” Zimmermann says. One “like” or hike at a time, the ambassadors aim to reach their plugged-in peers and ultimately rewire their perception of outdoor recreation and Texas state parks. As for Hill, he says his video shows that “you don’t have to be some kind of crazy Bear Grylls-type person to have fun camping,” referring to the star of TV’s Man vs. Wild. While not everything went as planned on the Tyler outing, the end result was a lot of fun for everyone. Hill said the Stephen F. Austin group now has plans for more trips to Texas state parks. “Even if it’s a small impact like that, it’s an impact,” he says with a smile. No matter the medium our ambassadors choose to reach and positively affect today’s youth, one notion remains constant: “We’re making investments in our future,” Harkey says. To find out more about becoming an ambassador and promoting Texas state parks with your community, go to www.texasstateparks.org/ambassadors. The first training session of 2015 will be in January.